It has been over 5 years since The Shop closed and every once in a while while working at the bench memories come back. One particular moment stood out for me the other day. 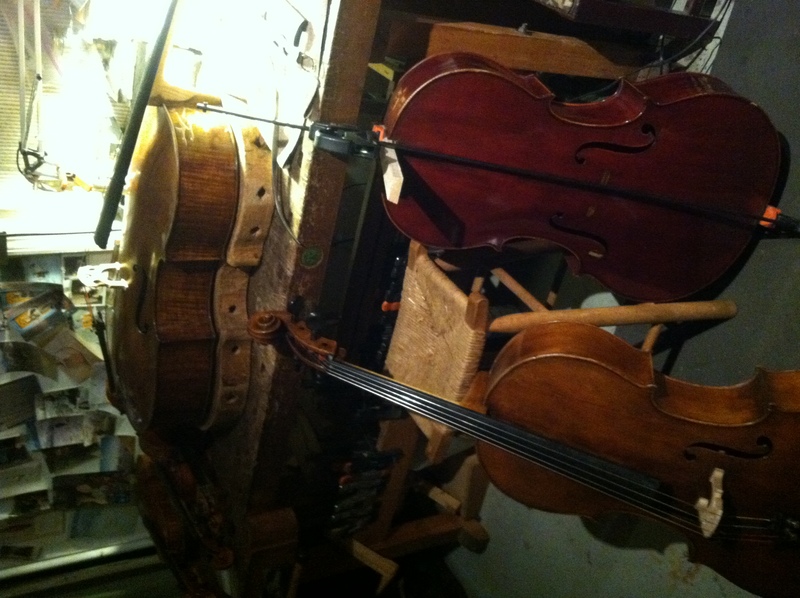 My good friend Jesus Morales showed me his new cello by the Swedish maker Peter Westerlund. It is a copy of the world renowned cello played for many years by Orlando Cole – The “Sleeping Beauty” by Domenico Montagnana made in 1739. It brought back the time when Mr Cole ( I could never call him Landy) brought his magnificent cello to us to sell on his behalf. Not only was it a wonderful opportunity to work on it and live with it for a while…it was a heady time when great cellists from all over the world came to explore it. One memorable moment in it all was the arrival of Heinrich Schiff from Austria ( who became the eventual owner of the cello). Mr Schiff brought with him the beautiful Mara Stradivari cello of 1711 that he was playing at the time. While trying the Montagnana cello upstairs in the try out room he left his cello for all to admire. While looking it over I noticed the top had a ripple effect that was curious….it was strange but not too alarming. Many instruments of this age have arching abnormalities that come from centuries of strain.When I had a chance to mention it to him he mentioned the unbelievable story that the cello had been on a river ferry in South America in the 1960’s that had sunk!….and that the cello had been submerged for a few days in the drink! When Mr Schiff took the cello to Austria part of the great Cole legacy went with him….but its interesting how it comes back indirectly. Ricardo Morales, the principal clarinet of the Philadelphia Orchestra, is passionate about the violin. He has acquired a beautiful Telesphore Barbe from me for his wife Amy Oshiro, who also plays in the Orchestra. He frequently talks to any of the visiting soloists about the makers they know in Europe and around the globe, He heard players talk of Peter Westerlund from Sweden and began collecting his work. Schiff had become friendly with Westerlund and had invited him to his home in Austria to view his impressive collection of cellos (see Westerlunds site) The one cello in the collection that stood out was the “Sleeping Beauty” and that is the cello he beagn to make….Well Jesus came to admire Westerlunds work through he violins of Ricardo and has become the owner of one of his cellos. So now I get to work on and admire a beautiful, faithful copy of the legendary Mr Cole’s broad, dark and gorgeous Montagnana.